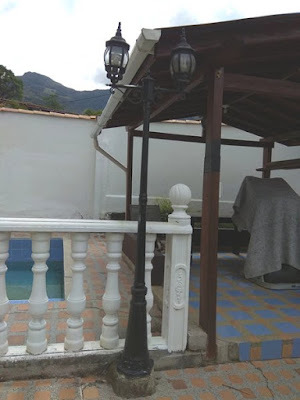 We had two garden 'street lights' alongside the swimming pool, each took two bulbs, and one had gone out in each, I thought it was just the bulb, but it turned out that it was the fitting and wiring. I had no idea how old they were, but the bases of each post had been patched with various materials over the years so it was time to replace them. This was the opportunity to reclaim space, as these were on the footpath, and I wanted to put lamps on the balustrade instead, out of the way. 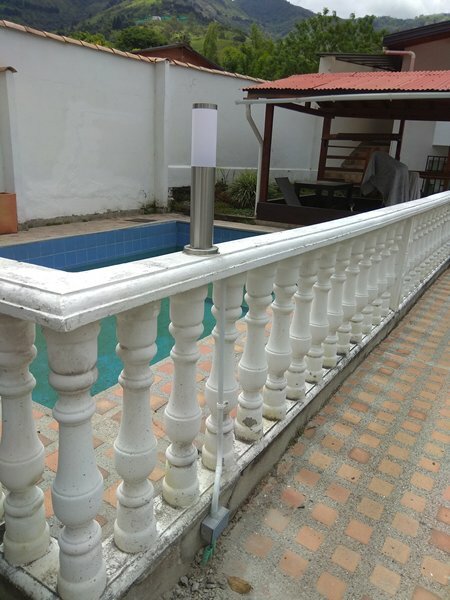 I bought the lamps, starting work yesterday, I drilled through the balustrade...gingerly, because I didn't want the concrete rail to split open, I gradually increased the size of my drill bit, until I had a 1/2" hole for the cable. Half way through the job, my Father-in-law Henry, arrived from Caucasia, we went for lunch, before returning home, and he then gave me a hand. We fitted a new junction box to the wall below, and ran the cable up in tubular conduit. that done, I then removed the old lamp, the hard part was the concrete base, they must have been about the only thing that was built here not to move. I ended up having to use my SDS drill to break it up. This morning it was time for number two, this was a tad more difficult, because there was no junction box, they had run the cable in the concrete without any protection, so I had to ensure I didn't damage it whilst breaking up the concrete. Before continuing, I mixed up some concrete and repaired where the two bases had been, I then mixed up some cement and did a repair to the wall, where the new junction box will go. I drilled the hole in the balustrade, cabled and fitted the new lamp, but then had to call it a day, I couldn't fit the junction box and conduit until the cement had gone off, so I will finish that up tomorrow, if the old cable isn't damaged, it will be a ten minute job, if it is damaged... a lot longer! Whilst this was going on, the Barber who had caused us so much trouble, and returned to work this week, after his stabbing, decided to open the main window on the parking area, in itself no problem, but he then turned his electronic music up full blast. There are ways to combat that, so out came the generator, placed under the window, and left to run. 40 minutes later the window shut, and hasn't opened again, but I still have the generator on standby!